My daughter's grad party was last Saturday, and it was a huge success! I feel like I was hit by a truck however. Very tired from all the preparation, and I get very stressed out entertaining a large crowd. The weather was great, the food supply was about perfect, very little leftovers! AND, the weather is getting warm, close to hot! It's summer in Northern Minnesota! I think I can put away the flannel pajamas! This is the back of the old college futon that I got back from my older daughter. I spray painted it white like my window box above it. It is framing out the hostas! 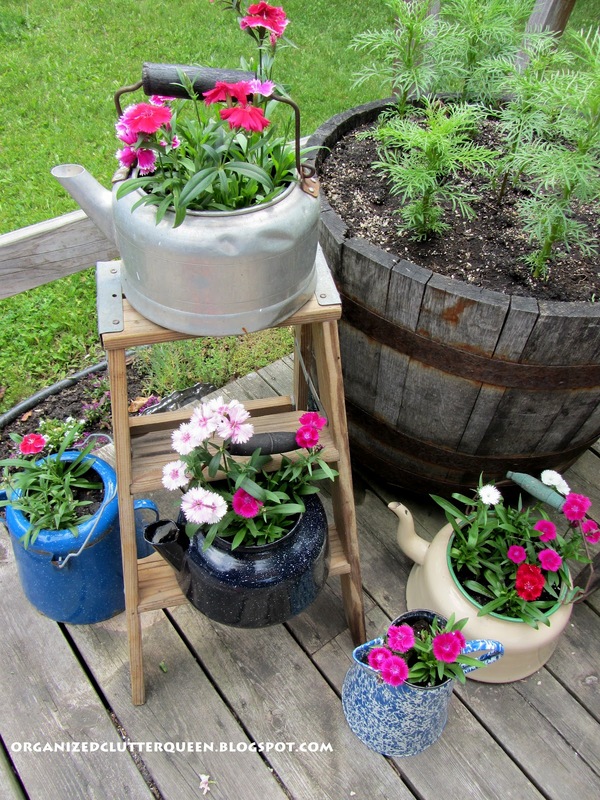 I bought this little step ladder at a consignment store for $5 and set it on my deck with teapots filled with dianthus. Framing out a hosta with plates. 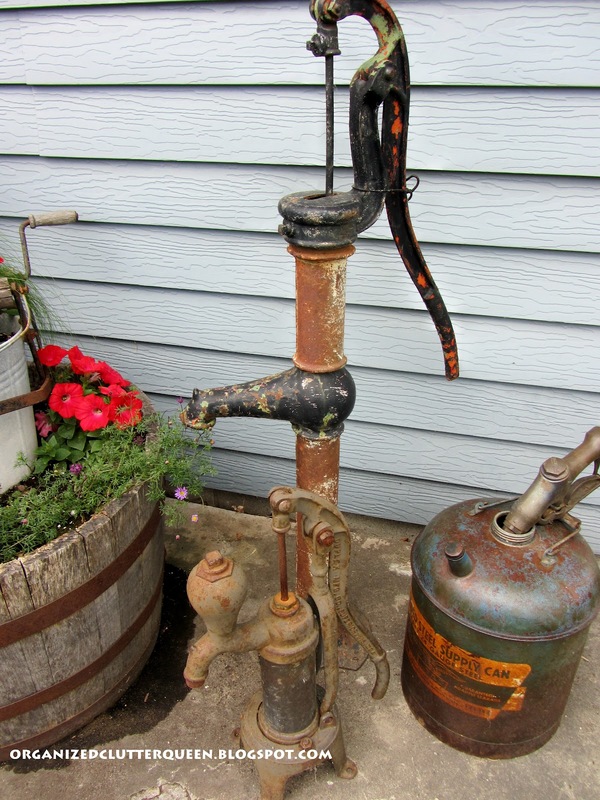 Quite a few months ago, I bought this old Buckeye gas nozzle from a consignment store for $6. 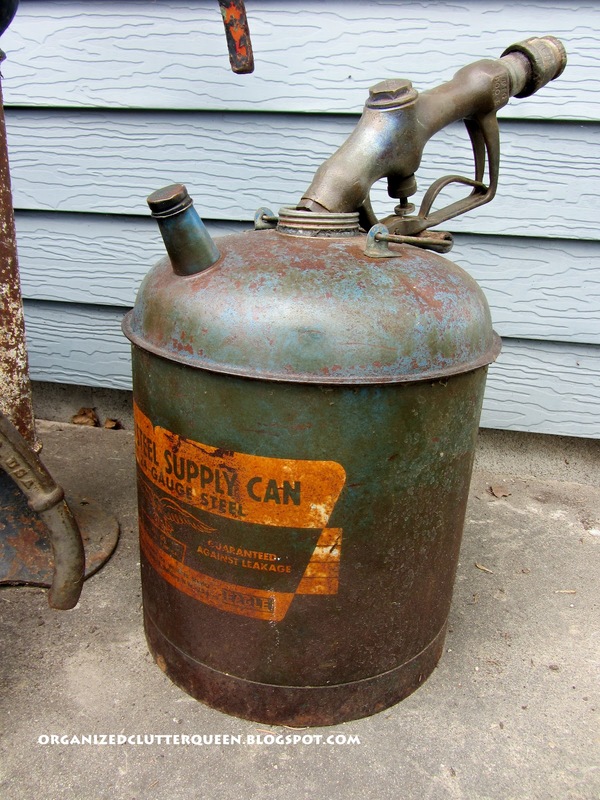 I just bought the gas can last week. I paid $25 because I have been looking for a cheaper one for a long time and couldn't find one. This one had part of a label and a little rust. I sprayed it with a matte poly and it brought out the blue color and the label colors, and I hope it will protect it from the outdoor elements too. My gas nozzle and vintage metal gas can are sitting on my front patio area with my water pumps. The large one is from my childhood home. (My mom used to have it by a wringer washing machine tub of flowers with the O. Johnson's on it in black letters). The small one was purchased at a neighbor's garage sale. I have old weathered barrel planters by the pumps. (Please remember this is northern Minnesota, and these flowers were just planted) I went with a red, white and blue (purple) color scheme. Red trailing petunias, purple million bells, brachome, alyssum, pony tail grass, bacopa and red trailing verbena. I love the old mop bucket too. Love the old tea kettles. What beautiful pictures! I love all your cute ideas. You do not waste anything do you? COngratulations to your daughter. Your decorating style is just what I enjoy. I really like what you did with the futon back and all of the vintage items. That gas can is a gem. I sooo love these garden accents.. they are awesome.. thanks so much for linking up to the ALL STARS BLOGGING BLOCK PARTY ...I'm going to be on the look out for some awesome vintage pieces like yours.. they ROCK! I love your garden, especially the Amish buggy wheel. I have one too, but it's in my living room! We bought it from an Amish barn sale in Northern Ohio and had it in the garden for many years. 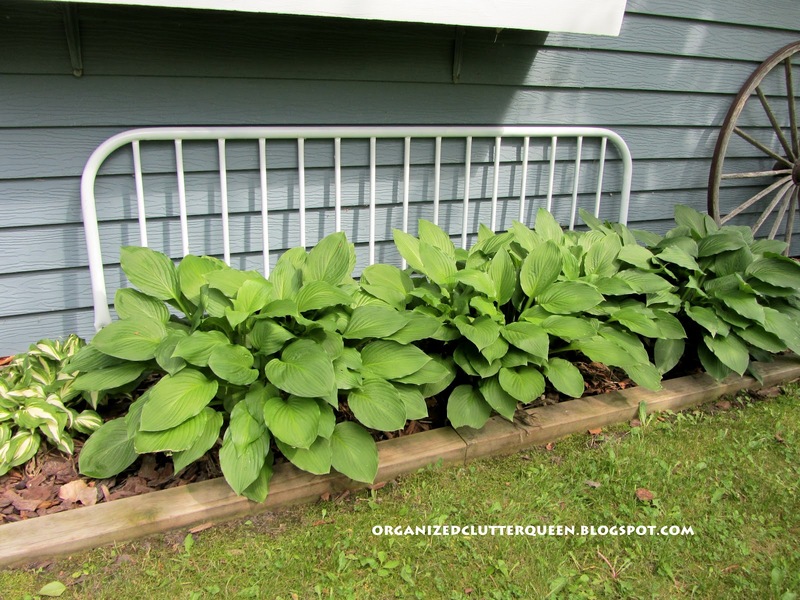 Love the futon back behind your hosta bed and the row of blue plates is so very charming too. The old kettles planted with posies is sweet and I love old barrels filled with plants. I so enjoyed your post. Thanks for sharing and have a lovely day. Just love all of your ideas to add charm to the garden -- especially the tea pots and plates used to frame the hosta. I came to visit via Jann's Share You Cup Thursday party where I am sharing about my garden friends. 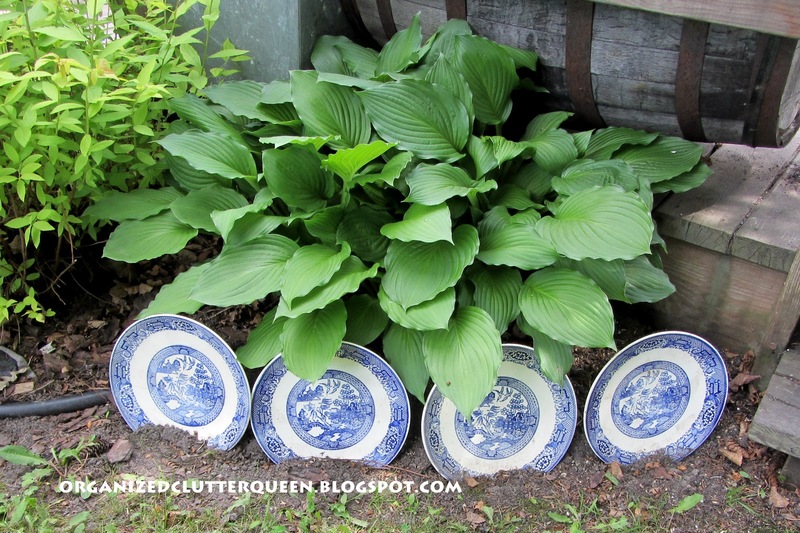 Your Hostas are So big and lush! I guess you don't have slugs or snails in you garden?! Love the variety of plants in your garden and all the vintage accessories. Are you sure we aren't related somehow? I adore your whimsy in the garden. Everything I want in mine! I hope you can rest up now! Entertaining like that is hard work. You yard looks so pretty with all your goodies and flowers! Love, love the old tea kettles in the garden, nice touches. Hi Carlene, girl you and I love the same things. I have a small step ladder by my deck and I have planted tea and coffee pots with flowers. I bought a cute white headboard at a yard sale last Fall for $10. I planned on putting it in the garden, but then my daughter saw it and we decided it would be so cute for little 2 year old Say dee. I love your plate borders. I would love to do that, but feel that I have about enough going on. Would hate to be a gobbster. lol! Thanks for sharing your darling creativeness with Share Your Cup. I love all the vintage in your gardens, everything looks beautiful! I love the window boxes and the gas nozzle set up!! Everything is so pretty! Happy to be your newest follower :) Found you on the blog hop! 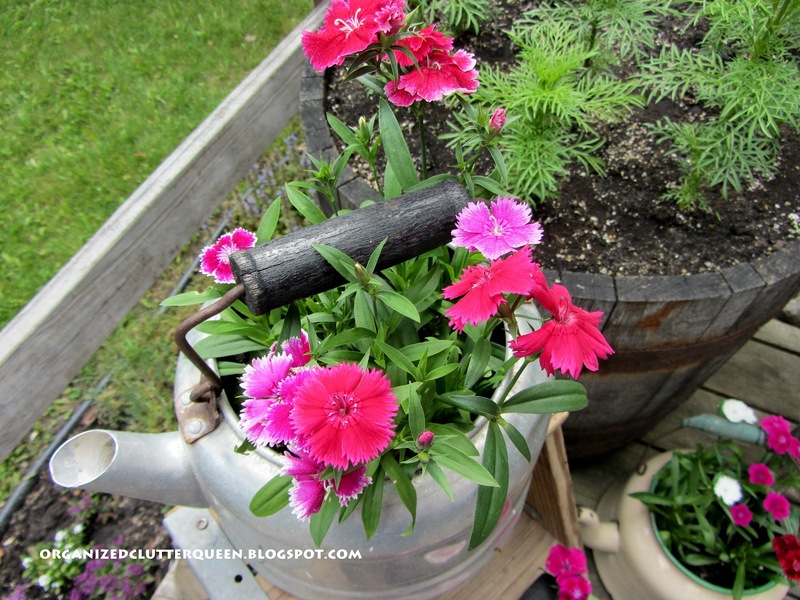 Love the vintage tea pot for a planter! I am going to have to keep my eye out for one of those! Nice work! Love your garden! It looks fabulous! Thanks for linking up at the All Star Block Party! 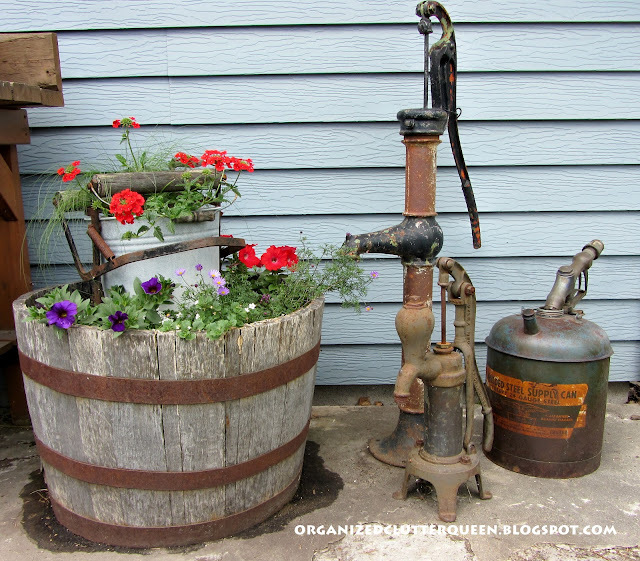 Love your patio vignette with the pumps and gas can. Lovely! Love all your junky finds - I love using ladders outdoors too! And I'm pinning that "bed" of hostas! I love your Rustic garden looks so lovely, especially the Amish buggy wheel. I would love to have one like yours, but I can not fine one in my town...I would put it on my mantle in my den !! Love, Love, Love! I have got to the teapots and the little step stool. Maybe I'll do that before I do the big ladder like you have. T he futon headboard is great! I'd plant something to vine all through it it is so cool looking. You are the most inspiring blogger I know! how cool! 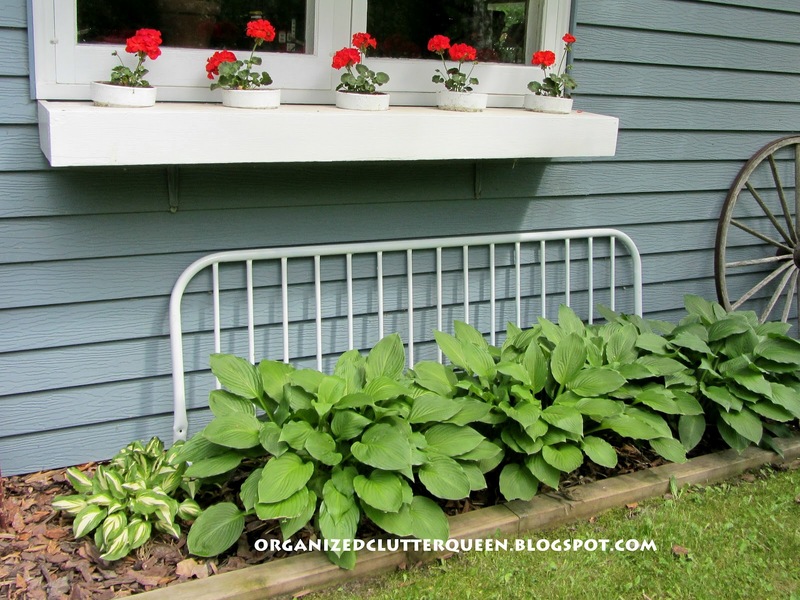 I was looking for how to repurpose my old futon that won't sell (!) and there you were. Great idea Carlene!